The Afghan government stayed away, saying the talks undermine its legitimacy. The two-day gathering was the second time Moscow has hosted high-level talks on Afghanistan attended by the Taliban in recent months. It comes a week after negotiations between the U.S. and the Taliban in which both sides agreed to a draft framework for a deal which could open a path to peace talks, raising hopes that an end to the 18-year war could be closer. Tuesday's talks were attended by around 70 political and social leaders from Afghanistan, among them former president Hamid Karzai, who said they hoped it could build trust and lay a foundation for a future political settlement that might help end the war. But the meeting also underlined the anxieties and political uncertainties raised by any possible U.S. pull out from Afghanistan. At the talks, Hamid Karzai and organizers said they were not seeking to isolate the Afghan government. Emerging after a day of speeches and standing alongside the heads of the Taliban delegation, Karzai said he wished the Afghan government had been present. “We understand the government of Kabul needs to be part of these negotiations. We wished that they would have been here today,” Karzai said, adding that he and the others had come as "as citizens of Afghanistan" in the hope of facilitating talks between the government and the Taliban. The head of the Taliban delegation, Sher Mohammed Abas Stanekzai, said the talks had been “very good,” calling them a “first step” towards peace. “This is the first step that we are taking towards peace, and God willing in the future we will have more meetings and we can go farther,” he said. The delegations on Tuesday met in the President Hotel, a Soviet-era complex owned by the Kremlin. After short introductory meetings, the delegates moved into a conference hall, sitting around a large circular table. The session opened with a member of the Taliban singing verses from the Quran, before leading all the delegates in a prayer. (Maxim Shemetov/Reuters) Afghan former President Hamid Karzai and other participants pray during a conference arranged by the Afghan diaspora in Moscow, Feb. 5, 2019. The Taliban’s 10-man delegation was from their diplomatic office in Qatar’s capital, Doha, which has also been handling the group’s negotiations with the U.S., also led by Stanekzai. Last week, U.S. and Taliban negotiators agreed in principle to the framework of a deal under which the Taliban would pledge to prevent Afghanistan from being used as a base by terrorist groups, and the U.S. would pull its troops out of the country. Chief negotiator for the U.S., Zalmay Khalilzad, has said any agreement would also require the Taliban to undertake a cease-fire and to open direct negotiations with the Afghan government. Although many obstacles to an agreement remain, Ghani’s government is concerned it could find itself side-lined by a deal that would see American forces abruptly leave Afghanistan, a possibility that has also seemed to grow amid President Donald Trump's recent push to bring the troops home. The prospect that the Taliban could return to power has also raised concerns in particular about the fate of women should they do so. In the TOLO News interview, Ghani though downplayed he was concerned by the U.S. talks, saying that all talks were set with his government and that any Taliban peace deal would have to be endorsed by the whole country. In a speech, Stanekzai said the Taliban was now not seeking exclusive political power in Afghanistan and promised that the group would protect the “Islamic rights” of women, including to work, education, property rights and to choose their own husband. He also attacked though Western television series which he said had paved the way to "immoral crimes" and had been imposed on Afghanistan. The Taliban was "committed to eliminate all those evil customs and traditions that violate women rights and do not comply with Islamic principles," Stanekzai said. Fawzia Koofi, a member of the Afghan Parliament said she had sought assurances from the Taliban at the meeting that they would not seek to reimpose their ultra-conservative interpretation of Islam which saw women deprived of basic rights. "Afghanistan has come a very long way and the Taliban should realize that, it’s not the Afghanistan of 2001 or 1995, which made women stay at home. If the Taliban would like to be a part of Afghan society, they need to adapt," Koofi told the Associated Press. Koofi said she believed the Taliban had “changed to some extent” and said its delegates had promised to respect women’s rights to work and education, and could even envisage a female prime minister. But she said some U.S. troops must remain as a guarantee those rights are observed. The peace talks’ location in Moscow also underlined Russia’s renewed involvement in Afghan affairs, three decades after the Soviet Union withdrew its troops from a disastrous war there. In November of last year, Russia’s foreign ministry hosted multinational peace talks in the same hotel as Tuesday’s conference. The Afghan government didn’t formally take part in that event either, but a delegation of Afghan politicians acting on its behalf did, along with Taliban officials. 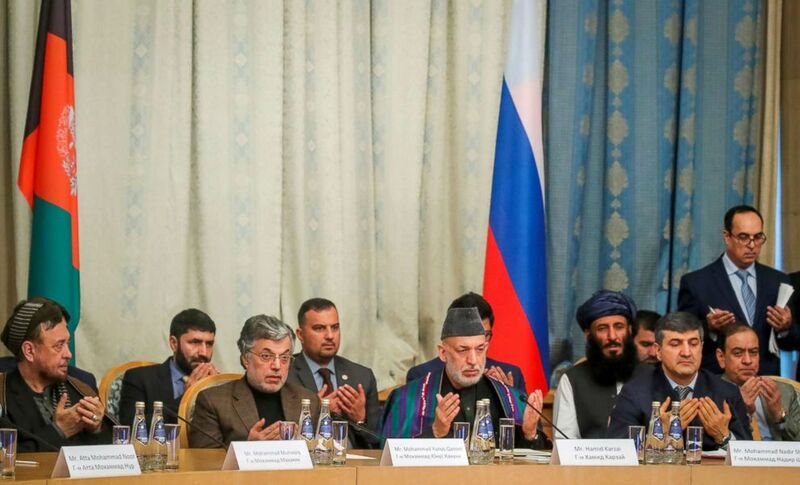 But the Taliban delegation thanked Russia for facilitating the meeting and said Russia was playing an important role. The conference's organizers said Russia was now able to act as an impartial moderator for Afghans. On Tuesday, violence continued in Afghanistan unaltered. A Taliban attack on police and army outposts near the city of Kunduz killed at least 23 members of the Afghan security forces, with 20 Taliban also killed.